This double-piston compressor is built for applications requiring up to 55 PSI. It delivers 1.10 CFM at maximum PSI. It is quiet, compact, and built-in handles make it extremely portable. Oil-less operation means no maintenance. The Scorpion II is easy-to-use via a simple on/off switch. An automatic shutoff feature reduces noise and minimizes motor wear. Reliable performance comes from a moisture trap and a filter regulator mounted into the table top airbrush holder. 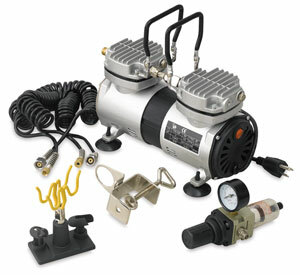 Two coiled plastic air hoses are included as well as a pressure gauge. The compressor head carries a finned lid, which provides for better heat dissipation.